As a new piece of upholstery is used, it’s possible that “comfort wrinkles” will begin to appear. This is a natural occurrence, and can easily be explained. Upholstered sofas are designed to have soft seating and back support. The plush seat cushions used in Birchwood’s upholstery, along with the lofty kodel wrap, will compress softly, providing the best level of comfort. These same features can create comfort wrinkles. This is an expected occurrence, and is not considered a defect. The fabric selected may show comfort wrinkles sooner than others. The amount of time it takes to appear can depend on the give/stretch of the fabric, but most fabrics will develop wrinkles with continued use. Comfort wrinkles will form faster and be more obvious on larger sized seat cushions. 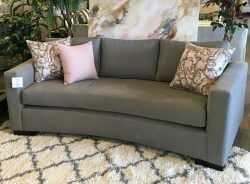 A full bench seat cushion like the Confederation sofa, or larger 2-seat cushion like the Beaumont, will show comfort wrinkles faster than a sofa like the Brant. The larger the piece of fabric and foam, the more the seat stretches when it is used. This will be even more obvious with a down-blend wrapped seat cushion. When it comes to comfort wrinkles, the best advice is education. Explaining this occurrence ahead of time will allow the end user to know what to expect with their furniture, and avoid complaints after the customer receives their piece.